A mounted gauge is read by volunteers who report rainfall amounts daily, including readings of zero. The reading from this gauge will likely not be zero with the storm approaching nearby. 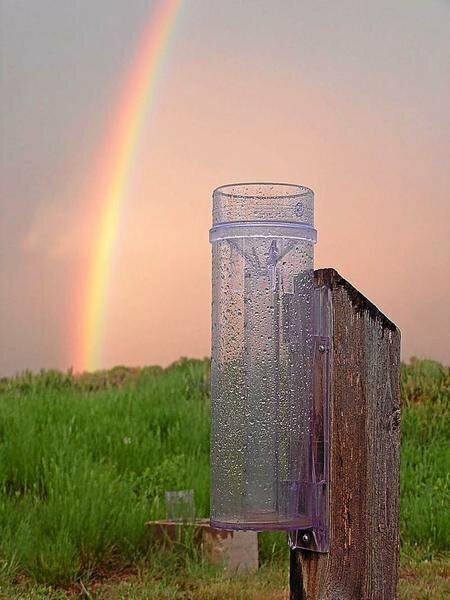 This gauge has been read and emptied after a rainfall as illustrated by the rainbow in the cleared sky. 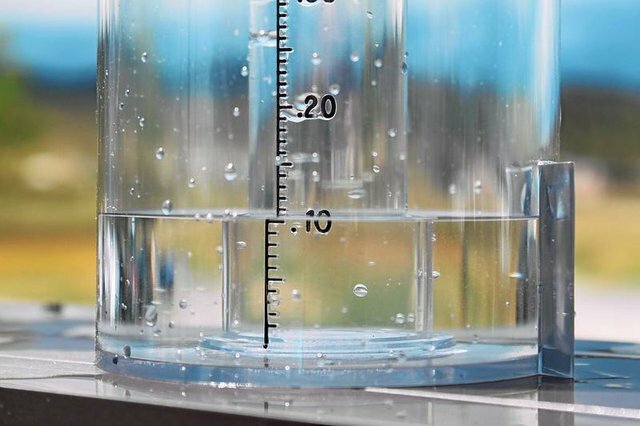 Close to 16,000 CoCoRaHS weather observers form the nationwide network of volunteers who measure rainfall from an official rain gauge like this one. People have been trying to measure rainfall for thousands of years. Ancient Chinese government records show that measuring rainfall occurred more than 3,000 years ago. Some of the best records were kept in Korea in the 1400s. A rain gauge was sent to every village to measure a farmer's potential harvest and to determine what taxes had to be levied on certain areas of the country according to the rainfall it received. In Texas, the Legislature would certainly have a fight on its hands trying to levy taxes according to rainfall the last few years. A grassroots effort to measure precipitation (rain, snow and hail) originated in 1998 with the Colorado Climate Center at Colorado State University. The network that was formed was named Community Collaborative Rain, Hail and Snow Network (CoCoRaHS). It is a unique, nonprofit, community-based network of volunteers working to measure and map precipitation. The network helps verify rainfall estimates and monitors regional rain patterns. The goal of the organization is to have an observer in every square mile across the United States. At this point, there are close to 16,000 observers in the United States. Anyone can participate with the only requirement being an enthusiasm for watching and reporting weather conditions and a desire to learn more about how weather impacts and affects our lives. The volunteer observers take measurements anytime a rain, hail or snow storm crosses their area. These precipitation reports are then recorded on the CoCoRaHS website cocorahs.org. This data is then displayed and used by the National Weather Service, meteorologists, emergency managers, USDA, the National Drought Monitor Center, city utilities, ranchers, farmers, gardeners, etc. 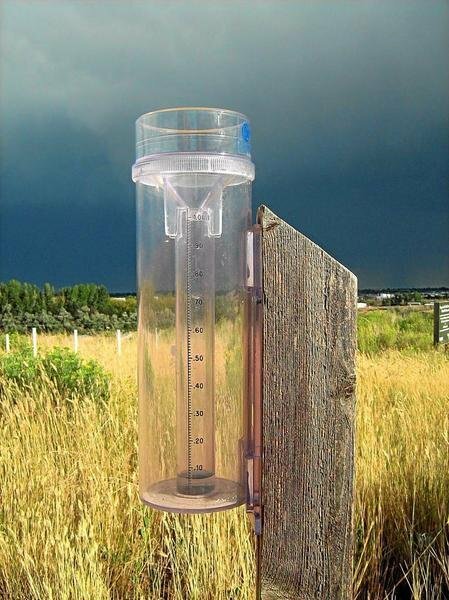 Cylindrical Rain Gauge and Training Needed - Volunteers need an official cylindrical rain gauge, some online training and an interest in weather to participate. The specific rain gauges that CoCoRaHS uses are available from several distributors on the network's website. Easy to Join CoCoRaHS - Becoming an observer is very simple. Log on to the CoCoRaHS website; go to Join CoCoRaHS. Fill in the form and submit application. Ordering the rain gauge can also be done at the same time. After the application is processed you will be given a station ID number and will be ready to start participating. Daily Reports Submitted - Daily precipitation reports should be submitted. If there is no precipitation that day, a report of zero should be recorded. I have participated in this program for more than five years, and honestly, I was doubtful that anyone really looked at my measurements on a regular basis. Well, I was very wrong. Last summer, northwest Goliad County experienced a significant weather event one afternoon. A thunderstorm passed over the area and dropped 3.5 inches of rain in just a few hours. The rainfall was recorded the next morning. Looking at the data from the other stations around, I realized we were the only station to report that much rain. Within an hour of my reporting this rainfall, a CoCoRaHS representative called to confirm the rainfall amount. I realized then that someone did look at the data that was submitted. A weather observer's job does not stop with just reporting precipitation amounts. On the CoCoRaHS website there is a link called "Significant Weather." For example, if you live in southern Victoria County and are experiencing severe weather, heavy rain, hail or tornados, you can go to the website and click on Significant Weather. A link will come up, and if you report what you are seeing or experiencing and submit, within about five minutes a meteorologist from the National Weather Service will call you. In this way, they can look at your specific area and see if a weather alert needs to be posted for your particular locale. Calling the weather service is not as efficient because sometimes the meteorologists are very busy looking at developing conditions and aren't able to take phone calls. One of the benefits of participating in this network is coming away with the feeling that you have made an important contribution that helps others. Providing daily weather observations helps fill in a piece of the weather puzzle that affects everyone whether you are interested in gardening or other activities affected by weather. • On left side of home page, click on Join CoCoRaHS. • Application will appear; fill in your information and submit. Official station number will be sent to you within a few days. After becoming official observer, log onto CoCoRaHS.org using station info and password. Go to My Data Entry. • Choose a time to report precipitation daily. • Submit amount; even a "zero" recording is crucial to weather report. After reporting 100 days in a row, data becomes official and part of the National Climatology Data Center. • Helps nurseries, farmers, ranchers and individual gardeners determine type of grasses, shrubs, trees, etc. that can be grown successfully. • Assists with scheduling irrigation and other cultural practices, i.e., fertilization, etc. • Helps warn community of potential danger through reporting significant weather to the National Weather Service.